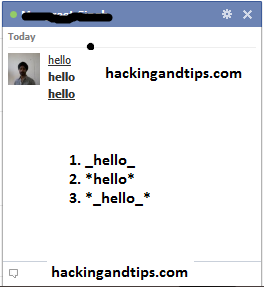 Well today I am going to teach you a cool facebook chat trick that most of the people are unaware of that is how to send bold and underlined text in facebook chat.This trick doesn't require any technical knowledge and it can be used by using just simple codes. Now here are the facebook codes for sending bold and underlined text in facebook chat. whatever you type between * *(two stars ) will automatically turns into bold.